Arizona, having any amount of marijuana is a felony. Despite the overwhelming national trend to legalize, decriminalize, and soften marijuana laws, Arizona continues to prosecute simple marijuana possession as a felony. This is largely due to the State’s financial incentives in prosecuting marijuana users. Despite its felony status, Arizona is one of many states that allows you to have a limited amount marijuana for medical purposes. Since 2010, under the Arizona Medical Marijuana Act (AMMA), qualified patients, registered with the Arizona Department of Health Services, may use and possess a limited amount of marijuana. You must have a current card at the time you’re found in possession of marijuana to avoid prosecution. Additionally, there are several limitations and restrictions under the AMMA. As such, card holders can face prosecution if they use marijuana outside the card’s privilege. What law criminalizes Marijuana use and possession in Arizona? Under A.R.S. 13-3405(A)(1), having less than two pounds of marijuana is a class 6 felony. The law is very clear: a person shall not knowingly possess or use marijuana. If you have more than two pounds of marijuana, or there’s evidence that you engaged in marijuana sales, you’ll likely face more serious criminal charges, often which, mandate prison. Possession of drug paraphernalia under ARS 13-3415, also a class 6 felony, is typically charged in conjunction with marijuana possession. Practically, however, there’s rarely an added impact to a paraphernalia charge; you don’t face extra punishment for drug paraphernalia. What constitutes possession of marijuana under Arizona law? Possession of marijuana can be actual or constructive. Actual possession is where you physically have the marijuana on your person. Constructive possession, on the other hand, is more complicated. Constructive possession is when it appears that you’re in control of marijuana, despite it not being on your person. For example, if it’s in your car, residence, or belongings, the State may prosecute by alleging that the marijuana belongs to you. There are a myriad of factors that can be considered in charging someone with constructive possession of marijuana. 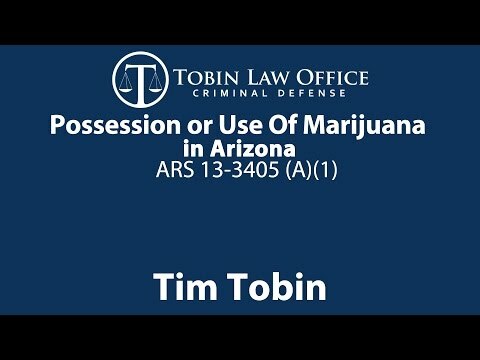 What are the possible penalties for marijuana possession in Arizona? For most Defendants, who have a limited history, a marijuana possession charge is often reduced to a class 1 misdemeanor when working with an experienced Mesa criminal lawyer. In addition, your Mesa criminal defense attorney can usually negotiate your entry into the TASC diversion program. Successful completion of TASC results in the complete dismissal of the charges, leaving you with a clean record. Penalties Where a Misdemeanor Plea Agreement is arranged by Your Defense Attorney. Marijuana Fine. Per ARS § 13-801, anyone convicted of marijuana possession must pay a fine of up to $150,000. The minimum fine you’ll pay is $1,372.50 ($750 plus an 83% surcharge) or 3 times that value of the marijuana recovered. Marijuana Probation. If it’s your first or second drug offense, and you have no violent criminal history, probation is mandatory. It’s usually 1 year of unsupervised probation. Unsupervised probation subjects you to random drug testing. As a condition of probation, you must attend 8 hours of drug education or complete 24 hours of community service. Deferred Prosecution: TASC Diversion in Marijuana Cases. common resolution in marijuana possession cases is TASC diversion. For most Defendants, the TASC program is preferred over a misdemeanor agreement because it avoids a criminal conviction. In addition, takes as little as 3 months, as opposed to the usual one year of probation that comes with a plea agreement. Upon successful completion of TASC, the charges are dismissed and there’s no criminal record. TASC diversion is within the sole discretion of the prosecutor’s office, but can be advocated for by your lawyer. In most cases, a defense attorney can negotiate TASC diversion for those with a limited criminal history. By prosecutor policy, a Defendant isn’t offered TASC if they have an affiliation with gangs, a violent history, or lengthy criminal record. Under the TASC program, marijuana cases involve 3 to 6 months of drug screening, education, and counseling. Participants cannot use drugs or alcohol while in the program; there are exceptions for prescribed medication and medical marijuana. You can also use medical marijuana with a medical marijuana card. These must be provided to your case manager at the beginning of the program. The cost of the program is $1,000, plus $14 per drug test. $150 is due at the first TASC appointment. Thereafter, you may set up a payment plan. Upon entry into the program, you must meet with a TASC representative at the courthouse and make an admission to the charges. Thereafter, there’s a mandatory three hour drug education seminar, periodic substance abuse counseling, and random urine tests each month. So long as the Defendant pays the TASC program fees and completes the program requirements, TASC can be completed in three months. Missed appointments and untimely payments will delay completion of the program. Failure to attend the seminar or counseling sessions can result in your dismissal from the program; furthermore, drug tests that demonstrate new marijuana use, alcohol, or positive results for other drugs, will lead to dismissal from TASC and reinstatement of prosecution. The only exception for drug use is if the Defendant maintains a valid medical marijuana card during the TASC diversion program. Possessing a green card permits a TASC participant to test positive for marijuana. Similarly, a Defendant may test positive for legally prescribed drugs. If you’re terminated from the TASC program, the charges are reinstated and you’ll be summoned back to Court. It’s generally advisable to hire a criminal defense attorney even when your only goal is get into TASC. Felony prosecution, at the Superior Court, is confusing and intimidating. Having a criminal lawyer simplifies the process and clarifies confusion. In addition, an attorney can ensure that a client is not taken advantage of when there’s available defenses or shortcoming in the State’s case. TASC diversion has particular and rigorous requirements; and thus, having an attorney consult and guide you helps avoid common mistakes that lead to dismissal from TASC. Lastly, if a Defendant is dismissed from TASC for non-compliance, a criminal lawyer can sometimes advocate for reentry into TASC by explaining mitigating circumstances. What is Proposition 200 as it applies to Marijuana Possession? Arizona’s prop 200 prohibits a judge from ordering jail or prison for first or second time drug offenders. Prop 200 doesn’t apply to those with a violent criminal history. If proposition 200 applies, the Judge can only order probation, fines, community service, and drug treatment. Due to these sentencing limitations, marijuana possession is frequently dropped to a misdemeanor or TASC diversion. If you fall outside prop 200’s protections, you face up to 5.75 years in prison. The actual range of prison faced depends on your criminal record. Common Defenses to Marijuana Possession. Insufficient Evidence: Especially in cases involving constructive possession, the State must prove, beyond a reasonable doubt, that a Defendant knowingly possessed Marijuana. Unless the State can prove you were actually aware of the marijuana, and exercised control over it, they cannot meet their burden. No usable amount of marijuana. While it’s true that any amount of marijuana is subject to prosecution, it still must be a usable amount. The State’s criminalist must be able to testify that the amount recovered by police is usable, or in other words, the psychoactive constituent—THC—is able to be consumed from it. If all that’s recovered is residue or shake, the charges may be dismissed. The State can technically still move forward on a drug paraphernalia charge; however, it’s the State’s policy to refer these cases to the city and justice courts for misdemeanor prosecution. Lack of Criminal Intent: No Knowledge of Marijuana. Under the statute, a Defendant must be in knowing possession of marijuana. As such, if you reasonably didn’t know the marijuana was on your person, in your vicinity, among your belongings, in your house, or in your car, there’s no criminal intent. There are many reasons and explanation someone might not know about marijuana. Constitutional Defenses. Defendants facing criminal prosecution for marijuana possession have constitutional defenses afforded by the United States and Arizona constitutions. Common constitutional issues include: lack or probable cause for search, warrant, or arrest; lack of reasonable suspicion for stop or detainment; illegal warrant; entrapment; custodial interrogation without Miranda warnings; denial of the right to counsel; and lack voluntariness in a confession. Arizona Medical Marijuana Act: A qualified medical marijuana patient may have up to 2.5 ounces of marijuana and up to 12 plants. If a Defendant is charged with possession of marijuana, despite having a valid card, the charges should be dismissed. There are, however, several restrictions and limitations to the green card. The Marijuana Belongs to Someone Else. It’s common for there to be multiple people present in a drug investigation. It’s also common that more than one person has access to the location where the marijuana is found. In these cases, there can be reasonable doubt. The Substance Recovered is not Marijuana. The state must have the substance tested by a criminalist. That criminalist must be able to testify, beyond a reasonable doubt, that the alleged marijuana contains THC. No Chain of Custody. The State must prove, beyond a reasonable doubt, that the marijuana tested by the criminalist, is the same marijuana recovered at the crime scene. That means every person who handled the marijuana must appear in court and accurately testify to their proper handling of the evidence. This is needed to establish that there was no mishandling or tampering with evidence. If there’s a break in the chain of custody, the charge should be dismissed. Call or Text Tobin Law Office for a Free and Confidential Consultation. If you, or a loved one is facing criminal prosecution for marijuana, please TEXT or CALL 480-447-4837. We can guide you through the daunting criminal process and explain how to avoid a criminal conviction for marijuana. Our consultations are free, friendly, and confidential. There’s never a sales pitch. Prospective clients are often surprised by how affordable it is to hire us for a marijuana charge. Marijuana defense is one our most affordable services due to the consistency in outcomes and criminal procedure.